Brief Background: Regulatory healthcare compliance education is required annually by state and federal agencies.There are many topics and they rarely change from year to year. The old training was primarily Powerpoint-based and almost entirely structured around the learner reading content. Project Goal: Update old education with modern user interface (UI), modern user experience (UX), and adult learning theories. Edit down topics into chunks and structure the training into micro-courses that can be taken all at once or at different times. Build in multi-media, interactions, practice, and knowledge checks. Primary Obstacles: The scope of the project covered dozens of topics, 12 Storyline modules which each contained several micro-topics, and more than 40 subject matter experts. There was a lot of room for growth and out of the box design, but there was also a lot of ground to cover in a limited amount of time. Demonstrations: In this module on patient care, there are two instances where the learner is being educated on proper procedure for running their own lab test on two types of labs they don't have to send out to be processed. My goal was to simulate the testing process using interactions and animation so that it wasn't just reading step-by-step and hoping they remember. In these instances, there was also audio narration, though the audio does not play during these demo animation clips. At the end of the first demonstration, learners actually have to complete the lab test and provide a reading. They receive immediate feedback on whether they were correct, or why they were incorrect. Micro-learning: The large modules were broken down into small courses that shared a single navigation but could be taken whenever they chose or in any order they chose. Each individual micro-course could be completed in 5 minutes or less by the average user. Because of the huge amount of information that was required to be packed into each course, I utilized other ways to visually chunk the topics to assist with the break down. In the examples below, you'll see that the navigation provided a color coordination and number that appears within the micro-course repeatedly. Individualized layouts were also used in each course to differentiate the topics. 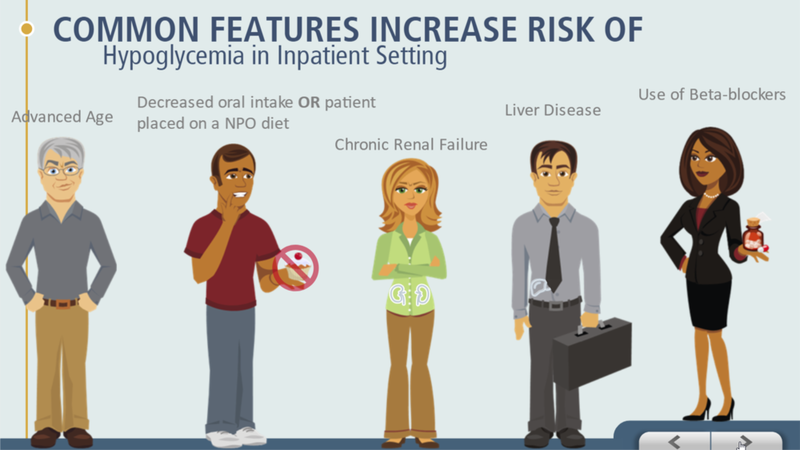 For example, Waived Testing, as seen in the two demonstration examples, and Diabetes, as seen in the screenshots below, are packaged in the same Articulate Storyline module and have an overall similar look and feel. However, the two topics separately have use slightly different layouts and colors, though they coordinate and have identical interaction rules so that there's no confusion. 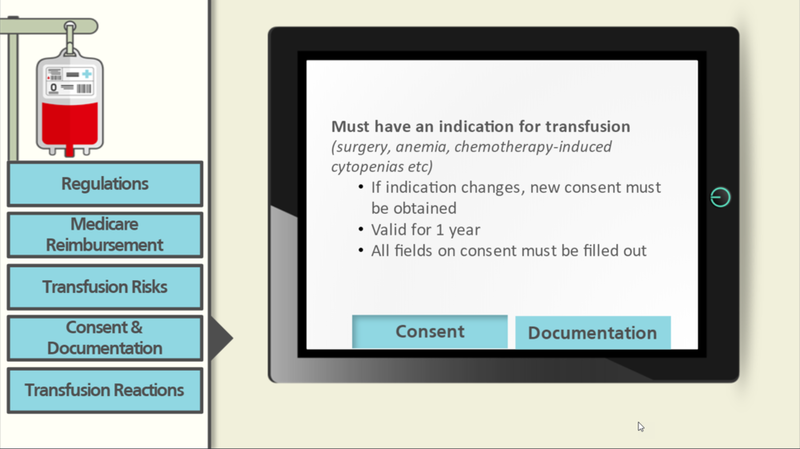 Coordination with the other modules: In the final examples below, you'll see screenshots and a use video from a separate module that discusses high risk medications and blood transfusions. 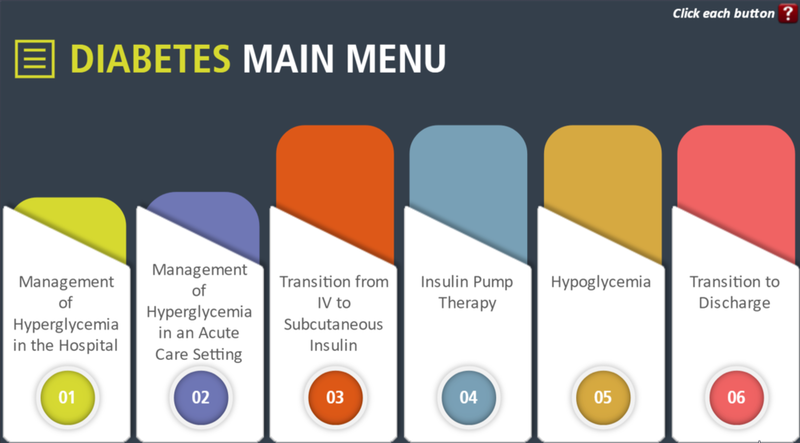 Both the lab and diabetes module and the blood transfusion module belong to the same curriculum, but are chunked separately with like topics. Still, the colors, fonts, visual style, navigation, and interactions all have a similar look and feel and all have identical behaviors so that the learner doesn't need to learn new rules and in fact, becomes more efficient and more competent the more modules he or she takes. The demonstrations were well received overall, and evaluations reflected a shift in mood around taking the required education. The primary comments centered around the way the modules looked and how it felt to take them, calling them "more professional" which was reflected in knowledge checks proving they paid the content more attention.